Me: It's almost Friday guys. What should I blog about? Child #2 (running in full of ideas): You should blog about our bathroom being like a workout room. You can hold on to the sink and do backward flips. You can, like, do sit ups in the bathtub. Oh, and you can also sit in the bathtub when it's empty and lift your bottom up so it doesn't touch the ground. Me: Is that why there are always footprints on the pedestal of your sink? Me: What else can I talk about? Child #2: Pencils. Oh, and did you know you can also do a handstand on top of the toilet. Me: Tell me more about pencils. Child #2: You can use pencils and balance them on their erasers if you're holding on to them. Me: But is that really balancing? Child #2: I've never tried it, but I'm sure it's possible. Child #2: Our bathroom would make a great workout place for football players to get a tiny bit stronger. Child #2: Because....I don't know. Umm, Mommy, did you know the bottom of my socks have holes in them? It's almost Spring Break and I'm feeling a little Spring Feverish. Today's post puts a whole new spin on the concept of child labor. What can I say? Maybe he'll get some new socks out of the deal. Labels: Children are so handy. When they aren't doing handstands on the toilet. Or letting the bathtub overflow. Or...oops I've got to go check out what's going on in that bathroom. Writing. Life. Family. I can just picture this conversation happening, and it sounds so much better than the howling match I had with my child this morning, as she missed the bus....AGAIN. Damn you, Daylight Savings Time! The back flips would concern me. Your bathroom must be really big. Kids are too funny. Their line of thinking- never ceases to amaze me. Oh my. I love this column SO much! That kid is a riot. Who knew bathrooms could be so versatile? I have to admit, I've never looked at bathtubs quite that way. 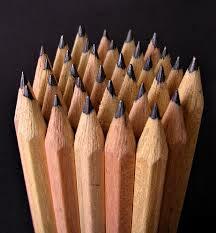 Yes, pencils can be balance upright on their erasers--so long as you have used the eraser. How I know this is another story, lol! I see a pencil-balancing contest in your future.